6th Grade Boys Basketball pictures will take place on Monday, November 27th. Picture forms will be sent home with players on November 13th. 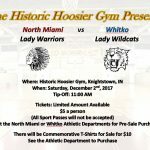 Friday, November 3, 2017 6:15 PM Whitko High School AWAY 42 Fort Wayne North Side HS HOME 46 Game Recap The Lady Wildcats dropped a close 46-42 decision to Ft. Wayne North. The Lady Wildcats were tied 14-14 after one quarter, led 22-16 at the half and trailed by two 34-32 into the fourth quarter. There will be 6th Grade Boys Basketball Parent Meeting on Wednesday, November 8th at 5:00 in the Lecture Room at Whitko Middle School.